I’ve been in my house for most of the time that I’ve lived in California — 19 years. And in all that time I’ve missed having the big, productive vegetable garden that I had in Pennsylvania. There are a lot of reasons that I haven’t been growing vegetables here; too little time, not enough sun, etc., but the big one is the really crappy soil in our area. Soil is so very important for growing veggies. Of course light, water and nutrition are key elements, but you can have all of those and still not be able to grow much in the way of vegetables if your soil is lousy. My soil is compacted and low in organic matter, a result of building practices in developments such a mine. Builders come in and level the ground, bulldozing away the fertile topsoil. Add the fact that the soil in this area is full of heavy clay, which stops tiny little roots dead in their tracks, and you have very inhospitable veggie growing conditions. The solution is to build raised beds that you can fill with beautiful, fertile soil and loads of compost. Which is what I did last week. This project is pretty easy. In spite of having only the most basic woodworking skills, I had no problem getting good results. I started with plans, which I modified it to match my needs, that I found on Sunset Magazines website. Now some of you may laugh at how little mine is (4′ x 4′), but I have only one tiny spot that gets enough sun for growing anything but part-shade plants. I decided on a smaller version than Sunset’s also because this is test run that I didn’t want to sink a lot of money into. If it works, I’ll get some of the eucalyptus trees that surround my yard trimmed or removed (Have you priced this kind of job lately? Yowzers!) and redo my landscape to accommodate larger beds. In the meantime, this project cost me about $90 and took about 4 hours. Here’s how I did it. I went to Lowe’s (wish there was a real lumber yard in the area) and bought top grade pine. You can use pine, redwood or cedar. The latter two will last a while longer but there are sustainability issues with the cedar. DO NOT BUY TREATED WOOD even if they say it’s the new, safe kind. I don’t believe any of it is food-safe and it’s certainly not organic. When you are selecting the wood look down the length of the board to make sure it’s not warped. A tiny bit bowing or twisting is ok, but it should be very, very slight. Also eliminate any lumber that has more than very minor splits on the ends or lots of knots. Lowe’s will cut any lumber you buy to your measurements for no additional charge — good thing because these boards would never have fit into my car, nor could I have managed the larger piece by myself. Some of the changes I made to the original plans were: I used 12″ lumber for the sides because I couldn’t see any reason to use two 6″ boards as they did in the Sunset plans. And I switched out their recommended 4″ x 4″ corner posts for 2″ x 4″ because my bed is smaller and I thought it wouldn’t compromise the sturdiness factor — besides it saved a little $$. I didn’t add the piping for the row cover hoops because it never gets that cold here, however my resident bird population may cause me to regret not being able to float some bird netting. I assembled the bed upside down right where I was going to place it. In retrospect this was probably a mistake that accounted for my not getting the box perfectly squared. So I recommend assembling it on a flat surface like your patio, deck or garage. 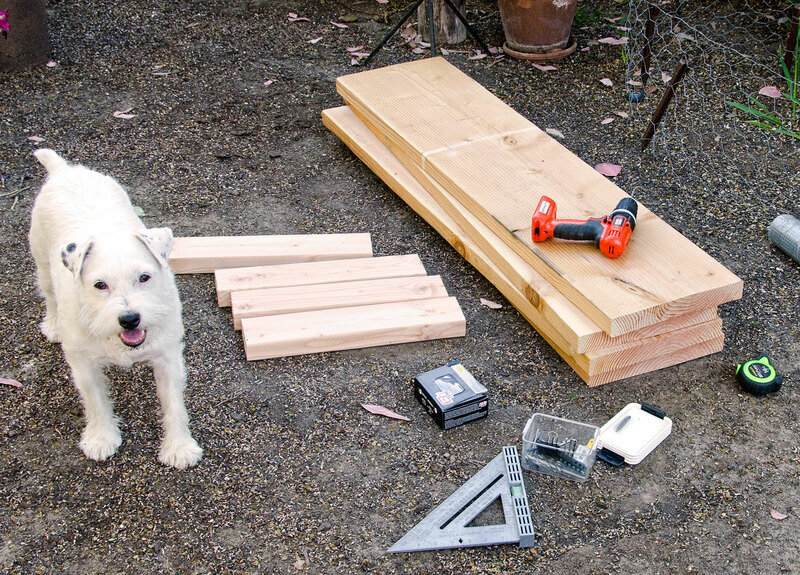 I did the whole thing myself, but if you can recruit a helper (one with opposable thumbs) so much the better. Lay down two of the 2 x 4s and place one 2 x 12 on top of them so they are right angles, lining up the 2 x 4s at opposite edges. Drill pilot holes to prevent splitting the wood. Use 3 decking screws for each end. Screw through the 2 x 12 into the 2 x 4s. Attach one plain board to one board with legs, making sure that the corner is square and the legs face inside the box. Be sure you place the screws so they go into the wood and not the gap between the side and the leg. Attach the second legged board to the opposite side. Next you should try to get the site as close to level as you can. Then turn the bed right side up and mark the soil where the legs will go. Dig holes four inches deep for the legs. Place the legs in the holes and fill them in tamping the dirt around the legs. 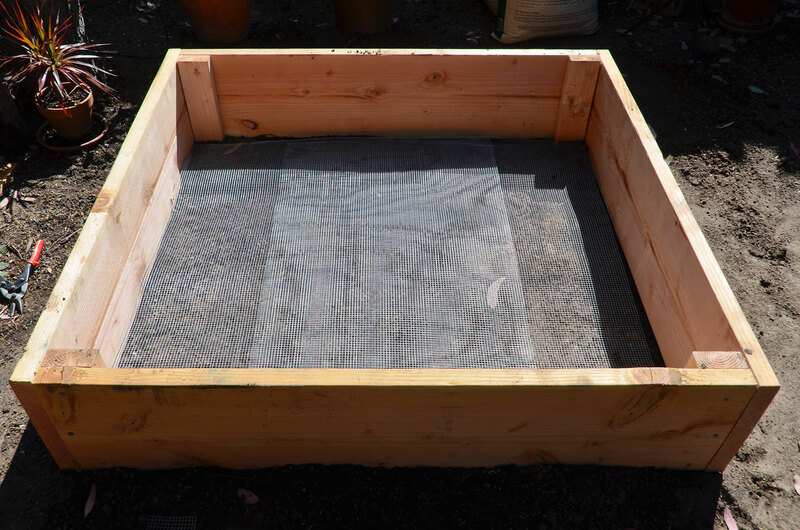 If there are slight gaps under the sides, take some dirt and mound it along the sides to fill them. Cut the hardware cloth to fit and lay it on the bottom. This is important if you live in an area with moles and gophers. 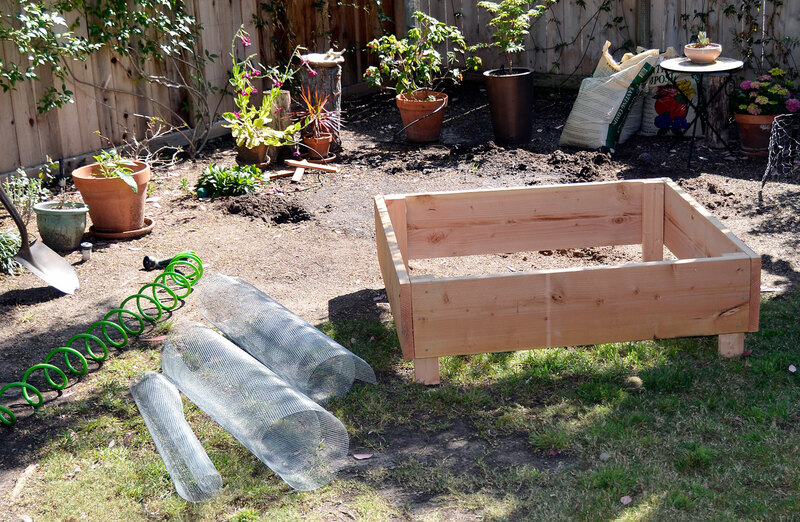 Dump the soil and compost in and mix thoroughly using the shovel and the cultivator. Soil should come to within 3 inches of the top. Add the organic fertilizer and mix that into the top 4 -6 inches. Gently spray water to moisten soil. It is little, but I’m very excited to have a vegetable garden again — no matter how small. Now Emmie needs a nap and so do I! Update: I should have mentioned that you can increase the size of this raised bed by at least two feet in length with no issues. I wouldn’t recommend increasing the width. 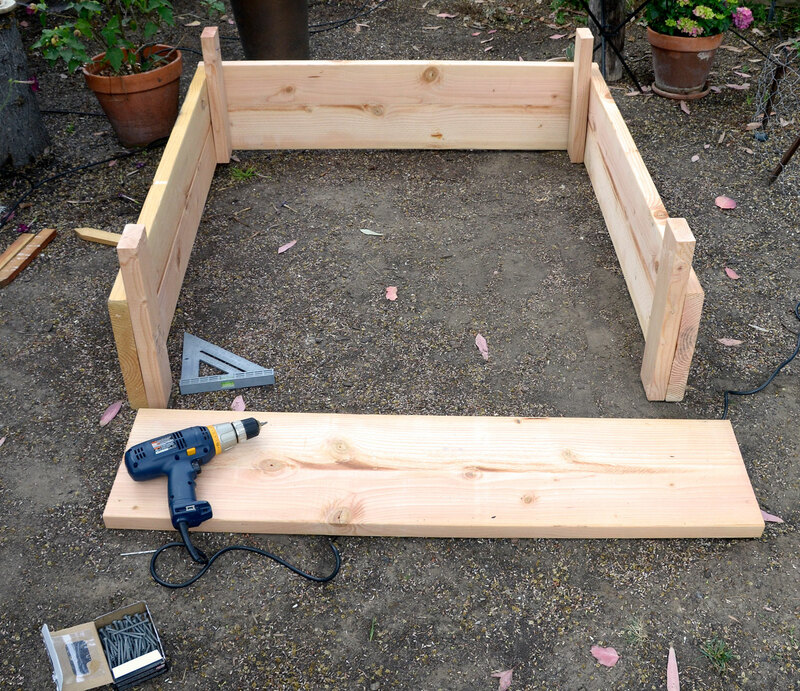 For raised beds 3′ to 4′ is as wide as you’ll probably want to go. It makes it easier to reach into the bed for weeding, planting and harvesting. Go You!! Here’s to homegrown garden magic! You should be. It’s awesome. Thanks much! I can’t believe that anyone really thinks treated wood is ok. Beyond my comprehension that they don’t think the chemicals wouldn’t leach into the soil and get taken up into the plants. Glad you didn’t buy it either! Have you tried Ganahl Lumber for a real lumberyard? 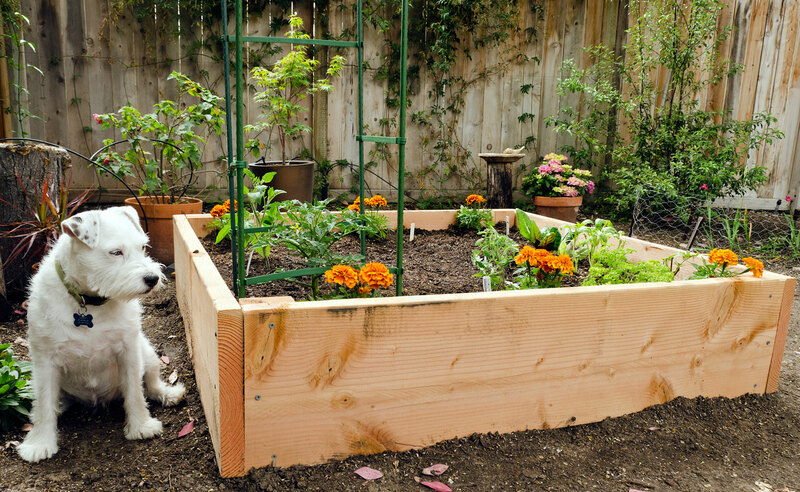 That is a beautiful raised bed you’ve made there. Thanks, Jeff. I appreciate that coming from the man of many raised beds. Haven’t tried Ganahl, but if you recommend it I certainly will. I love your terrier! Mine helped supervise the building of my raised garden beds too and featured in my photos (though he was less well behaved and ended up inside the boxes…..
She was unusually obedient in that last shot, but it was because she was hiding from a bug that was pestering her. Great post. I have several raised beds. I like they way you put this one together. Very neat looking. Thanks.